Home > Get Building > Ensuite Bathrooms: Are They Worth It? Times were when a typical family home was lucky to have a bathroom at all. An outside toilet and a tin bath in the kitchen moved on to the one family bathroom. The en suite bathroom was a luxury and just for the master bedroom in the home. These days it is becoming popular to have as many bathrooms in the home as there are bedrooms – more in some instances. The family bathroom can be a busy place, especially first thing in the morning when adults need to be at work and children to school. Daily baths or showers are now the norm so space for washing and grooming oneself is now a must and not a luxury. If just one bedroom can boast the use of a bathroom the stress is off that early morning rush. 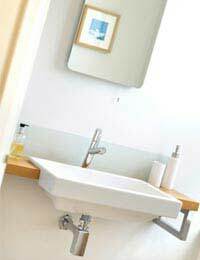 A wash basin, toilet and shower (or bath) are the usual required components for an en suite bathroom. The bath depends on whether there is room. A popular choice these days is the en suite wet room which does away with the need for a shower base as the whole room becomes waterproof with the water running away on a sloped floor with a small drain. Sunken baths and Jacuzzis can be seen in the larger and more luxurious en suite bathroom if there is the room. Moving to the shower itself there are a multitude of designs from a simple corner shower to invigorating power showers with all types of heads to massage and invigorate. Choose your en suite fittings carefully before designing the house as what you want may not fit into the room. Rather than have two extra en suites for guests or younger children why not consider a Jack and Jill bathroom? This is a bathroom with two doors one leading from each bedroom (sometimes with another door to the hall). The bathroom then provides facilities for two rooms with only the cost of fitting out one bathroom. How many bedrooms do you require in your self-build home? Would adding en suites lose a much needed bedroom? Why not consider utilising space in the bedroom for an en suite? Slightly less wardrobe space could mean fitting a shower into the corner of the room. Using glass tiles or panels would let light into what would be a dark corner. If the room has sloping eaves would a bath tub fit under an area that would usually be wasted? Look on the landing, is there room for a wash basin and toilet that could be turned into an en suite for the bedroom next door. It’s better to fit an en suite into the build rather than knock walls down once the family has moved in. Is your home in the country? Or do your family members have hobbies that mean they come home covered in mud? An en suite to the utility room or even the kitchen can be a boon as it stops a trail of mud and mess through the house. When designing your new home why not make the downstairs cloakroom slightly longer? Adding just a few feet to the length of the room will make room for a shower base. If the addition of en suite bathrooms is at the expense of another bedroom then no, the en suite will not add to the value of the house. If additional en suite can be fitted to existing larger bedrooms by moving cupboards and careful design of the room then they can attract the home buyer as they make your home more appealing.